Nothing really much more needs to be said on this one, does it? 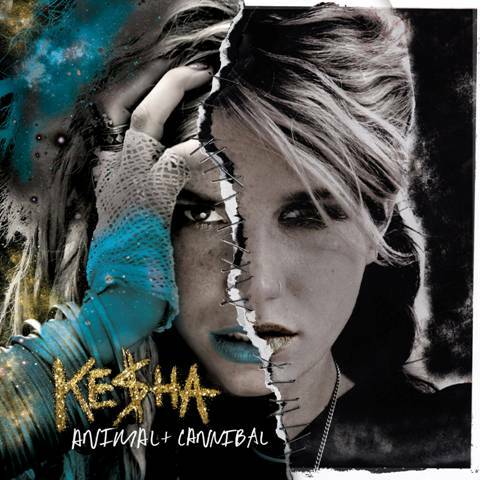 The official cover image for the new repackage of Ke$ha’s album ‘Animal’ with the new EP ‘Cannibal’ (notice the delightful ripped paper/stapling detail down the middle indicating it’s a bit rough around the edges). It’s in the shops Friday November 19, with the new single ‘We R Who We R’ due at digital retail on Friday. Friday release is very clever, I think it’s a hot chance for a #1 debut. I hope they release a standalone EP version of ‘Cannibal’. If not, I will have to iTunes all the new tracks. And Chris A, I’m not totally sure if this one will hit #1. It may of already reached the top spot on iTunes U.S. and Canada, but Australia is so slow to pick up on new songs. It might be a while until it makes the top ten even. So yes, it may be a future #1, but not right away though. However, anything can happen, especially if people know about it. Not sure just yet how this project will go. Hopefully people will have the chance to purchase the songs from ‘Cannibal’ separately when it’s released.